You could try disabling the second session by setting DBFlags. I can contact you because I am peoplesoft developer and I have a huge problem. The analysis of our DBA is: module PSAPPSRV @ gmapwas02 (SYSADM.PSUPSWORKLIST) deletes the data. Do you have an idea, where it could be executed DELETE? This sort of thing is always difficult. I don't know what PeopleTools version you are using. If you are running 8.50 or higher, then the module will be set to the PeopleSoft component name. However, the module is still set to PSAPPSRV when the application server process starts which would suggest this is happening during server startup. If you are using 8.49 or lower. module is only set to PSAPPSRV at startup, and delete on PSINSTALLATION could be anywhere. If you can't reproduce it while running trace, then a possible option is a technique (I have this heard called 'intelligence by return fire') is to stop it happening and create an error when something tries. Create a database trigger that fires on delete on this table and raises an error that will in turn cause the PeopleSoft transaction to fail. Hopefully, somebody will then report the error in a support call. How can we implement the same logic in SQR. If we run the sqr concurrently,weather it will give same Id twice. 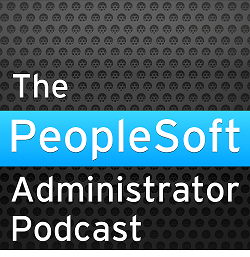 I ought first to say that PeopleSoft has moved away from SQR. So this is not a problem that they will address. The only suggestion I can make for SQR (and I have NOT tried this myself) is to encapsulate the logic in PL/SQL and use an autonomous transaction so you can commit it independently.